Notes: 1 Difference between rates for under age 18 years and age groups 18–44 and 45–64 is statistically significant (p < 0.05). 2 Difference between rates for 65 and over and age groups 18–44 and 45–64 is statistically significant (p < 0.05). 3 Difference between women aged 45–64 and all other age groups is statistically significant (p < 0.05). 4 Difference by gender is statistically significant (p < 0.05). 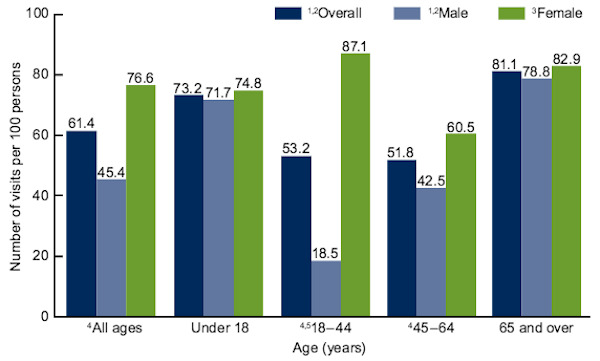 5 Difference between men aged 18–44 and 45–64 is statistically significant (p < 0.05). This entry was posted in Medicine and Society Data Watch on February 3, 2016 by Genevra Pittman.